Melba Whetung Loft declared as a Baha'i August 5, 1938. Her husband James Loft was a Mohawk Baha'i. GRIEVED PASSING MELBA LOFT SHINING EMBLEM NATIVE PEOPLES NORHT AMERICA. HER LONG TEACHING SERVICE MARKED HARDSHIPS ILLNESS ULTIMATELY EARNING RESPECT RECOGNITION HER BELOVED FAITH AND ENRICHING ANNALS CAUSE FOSTERING CLOSE TIES BETWEEN INDIGENOUS AND OTHER BELIEVERS CANADA. KINDLY CONVEY FAMILY FRIENDS ASSURANCE PRAYERS SHRINES PROGRESS HER NOBLE SPIRIT ABHA KINGDOM. Sarah Melba Whetung was born on the Curve Lake Indian Reserve, near Peterborough, Ontario, Canada on 24 December 1912. Curve Lake is an Ojibwa Reserve. Melba was the eldest daughter of Arthur Whetung, a trapper, and his wife, Bella. Melba finished grade school at twelve years of age and, with her mother’s help and encouragement completed her high school education in Peterborough. At seventeen years of age she met Alfred James (Jim) Loft, a Mohawk. They married several years later and lived in Detroit, Michigan, U.S.A. where Jim worked a the Chrysler automobile plant. Their two sons, James Gordon (Sam) and Arthur Edwin were born in Detroit. In 1936, Jim was transferred to the plant in Marysville, Michigan where he bought a home. In 1938, a daughter, Evelyn, was born to Jim and Melba. It was shortly after this that Melba became restless and searching. She missed the Indian way of life. She became close friends with her neighbor, Emma Lenk. Returning from church service one day Melba said, ‘There’s got to be something besides this!’ Shortly, after that Melba and Emma learned of the Baha’i Faith and embraced it. The guardian’s letter, which included, in his own hand ‘assurance of my abiding and deepest appreciation of your services to our beloved Faith, of my heartfelt admiration for the spirit that animates you and of my ardent prayers for the success of every effort you exert for its promotion ad consolidation’, and which was signed ‘You true and grateful brother, Shoghi’, marked yet another turning point in their lives. Jim was able to set up an auto body shop on the Reserve as a means of livelihood, though they still had no running water or indoor plumbing, and almost all of Melba’s good furniture had to be sold to buy equipment for the garage. The Lofts had visits from many Baha’is in those early years, many of them o their way to pioneering posts all over the world. The first people Melba and Jim brought into the Faith were Bert and Elizabeth Curtis, in 1950; and the next year the first Indian believers in Tyendinaga were May and Russell Hill. The Lofts supported the teaching work in the nearby towns of Kingston and Belleville by offering encouragement and attending meetings. Peggy Ross, who was called by Melba ‘me spiritual mother’, spent much time on the reserve an was like one of the family. Jim died suddenly on 22 May 1973. (see ‘In Memoriam’, The Baha’i World, vol XVI, p. 514.) Melba continued to live alone for the next eight years.An occasion for rejoicing occurred in November 1976 when Indian Baha’is from Ontario to the Maritimes gathered at Tyendinaga Reserve for the first Canadian Native Council. Although the Indian Band Council had been generally unsympathetic towards the Faith over the years, not permitting public meetings to be held and denying the Baha’is access to the village meeting hall, a victory came in February 1977. Just prior to attending the Baha’i International Conference in Merida, Melba approached the Chief and the Council to ask whether they wished to send a message through her to the Mayan Indians of Mexico and, to her deep joy, the Chief responded by writing a letter. Not only did this message reach the Mayans but it reverberated all through the Caribbean, for Melba was invited, along with other Canadian Indian participants at the conference, to be interviewed on television and she responded by reading the Chief’s letter, thus enabling the greeting to span the continents. The patience with which she had for so long endured rejection and suspicion won, in the end. At Naw-Ruz 134 (21 March 1977) permission was granted by the authorities for the holding on the Tyendiaga Reserve of a public New Year observance which was attended by one hundred and fifty guests. Melba also had a non-speaking role in the music video film ‘Mona with the Children’ honouring the young martyr Muna Mahmudnizhad. Melba’s outstanding contributions as a Baha’i were given special recognition when the hall of the Yukon Baha’i House in Whitehorse was named after her. Knaaj-Kwe - the Indian name meaning ‘good, kind and gracious lady’ bestowed ypon her when she was littel by her father. Larry grew up in the Midewiwin tradition. 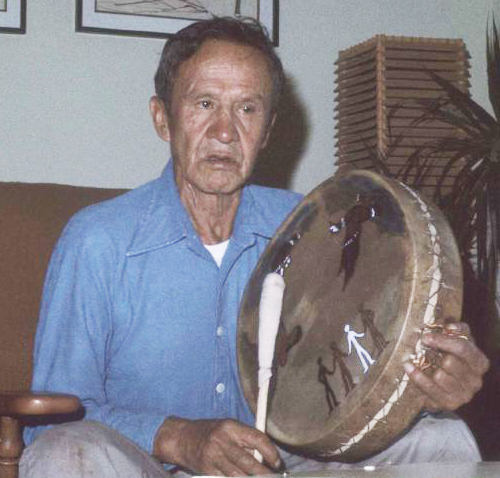 Larry wanted to cooperate in researching traditional songs and stories and help to clarify misunderstanding contained in the Smithsonian Archive of Mide Songs and also add to their resources in order to help preserve the old Ways. He died before this could be accomplished.